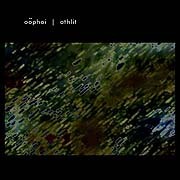 On Athlit, Italian sound designer Oophoi (Gianluigi Gaspaetti) offers us a continuous flow of minimalistic "deep listening" soundscapes. Utilizing drones, environmental sounds and reverb enshrouded synth accents, the music creeps forward in slow motion to an unspecified destination. Any changes in tone or mood are deliberately planned and executed so as to not disturb the suspension of time. This piece has the characteristics of an engulphing bank of fog - immeasurable and mysterious. Its blurry borders, soft edges and gradual pace all aide in transcending us beyond the real world to that inner realm which is unique to each individual listener. The track titles, "Drifting Into Blank Space" and "An Ever-Changing Horizon", are aptly descriptive of music with no center or focus. Oophoi always works with scale, not size. Athlit is a work of pure sound-art and is devoid of a subject. The result is an indivisible whole that represents nothing but itself.